The Bloody Sunday March for Justice programme will see a raft of civil rights events and speeches held in Derry. This year’s programme of events has been themed ‘Resist’. Fourteen civil rights demonstrators were killed when British soldiers opened fire without warning on the streets of Derry’s Bogside on January 30, 1972. The massacre, and the continuing campaign for justice is marked every year with a march along the same route as the original demonstration. In a statement the organisers this year said: “The programme will reflect the resistance to continued attacks on civil rights and liberties whether in Ferguson USA, Palestine, Dublin, Belfast or indeed here in Derry itself. This year’s march will finish at Guildhall Square in Derry City Centre, where the organisers have announced that the Reverend Sekou Osagyeyfo from Ferguson and the anti-austerity, anti-water charges TD Clare Daly TD will address the rally. Prominent republican Bernadette McAliskey is also due to chair two discussions at the City Hotel on successive Thursdays. Bernadette McAliskey (chair) with an invited panel of speakers to include Liam Wray, brother of Bloody Sunday murder victim Jim Wray. 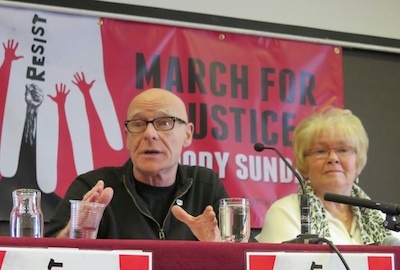 Chair Eamonn McCann, speakers include: former Guantanamo Bay internee Moazzam Begg and the Reverend Sekou Osagyeyfo from Ferguson, who will speak about the killing of the young black man Michael Brown by the Missouri state police. More events and information are due to be placed online at www.bloodysundaymarch.org.